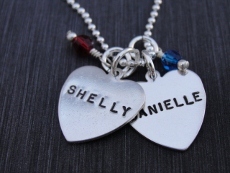 Our sterling silver heart necklace is hand stamped and personalized with a name or affirmation. Choose from two size hearts. The 1/2" heart can accommodate 6-7 script style letters and 7-8 block style letters. 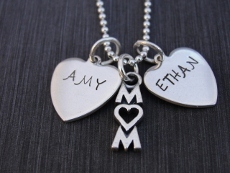 The 5/8" heart can accommodate up to 8-9 script style letters and up to 10 block style letters. The hearts hang on 16, 18, or 20" sterling silver ball chains. To order this item, please select a style with or without a spacer, font style, enter name(s) (one per disc), then click the Add to Shopping Cart button.